I’ve finally got my new platoon for Chain of Command ready. For some reason I thought it would be a good idea to do all the AFVs and most of the supports first, and only start on the infantry sections last. One nice thing about doing it that way is that by the time you get the infantry ready they’ve got a good range of supports to play with right from the get go. As the NZ army’s premier division 2 NZ used the national symbol, the Silver Fern. My plan for this platoon was that they can represent the Kiwi troops in the Italian theatre, or Poles in NW Europe. The uniforms and weapons are mostly identical. I’ve left off any unit patches to keep them generic. The vehicles will have the national markings for whatever I’m more likely to use them as. For example, the Cromwell will be painted for the Poles while the Kiwis get the Shermans. After the defeat Germany had inflicted on the five years earlier, the Poles must have really enjoyed the chance to take German prisoners. The bulk of the platoon is Crusader metal. North Star were doing a platoon deal a while back (three rifle squads, command, support weapons and a tank) so I grabbed one. I asked nicely and they swapped all the Sten-carrying miniatures for ones with Tommy guns. The troops in Italy kept their Thompsons from the desert (all the new bling tended to go for the freshly raised and re-equipped units earmarked for Overlord). I’ve done two PIATs and two 2″ mortars, as they’re both cheap support options. The bundle came with a couple of officer figures, this one looked most like a junior officer. The platoon sergeant, again with Thompson instead of Sten. I like these Crusader sculpts, and they had almost no flash or mould lines so were easy to prep and paint. I’ve got three sections of 11 men with another sitting in a painting queue. The Poles will be using the organisation from the rule book, while the Kiwi sections vary between six and 11 men, depending on the type of unit and stage of the war. There are a few Warlord plastics in this mix. I’ve used them when I needed a special conversion or an extra miniature for things like support weapon crews (why are these things sold with such small crews?). There are a handful of Warlord metals in there too, mostly the engineers. Those little guys should come in handy for Italy games where the Germans are heavily dug in. They’re nice miniatures actually, but have a slightly different style to both the Warlord plastics and Crusader metal. To be honest the Warlord plastic late war Brits are a pain in the arse. Each man is up to ten tiny fiddly parts (eg: legs, torso, left arm, right arm, head, helmet, pack, entrenching tool, weapon, gas mask bag, etc) so they take ages to build and can look a bit like a bunch of parts glued together instead of a single miniature. Getting them posed naturally takes a bit of trial and error, cutting and shaving, etc. I wouldn’t want to build a whole platoon from them, but they’re fine for the occasional figure. To be fair to Warlord their more recent kits have taken on board this criticism and cut down the number of pieces. Things like having both arms holding a weapon as one piece goes a long way IMO, and there’s no need for helmets to be separate. The sculpting of the faces on the plastics is a bit cartoonish, they look like bad stereotypes of what people looked like in the 40s but this does at least give them a bit of character. Overall I don’t mind as they’re a small part of the platoon, and often used as “characters” such as medics and forward observers. 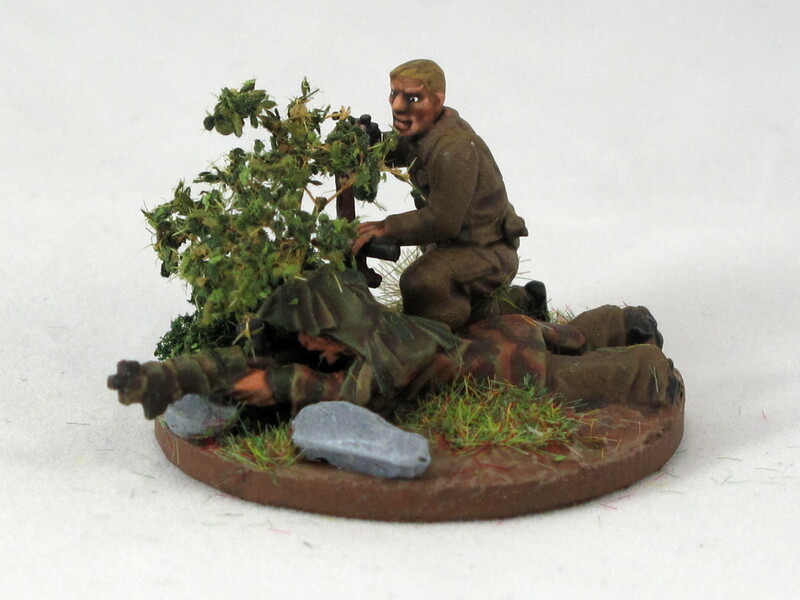 The spotter in this sniper team is another Warlord plastic. Warlord sell single sprues with about five men on them, if you don’t need loads then that’s a good option, especially if you catch them on their occasional half price sprue sales. I just sawed them in half at the waist and stuck them into fighting pits like I did for my Germans. I had a hard time finding a decent sniper miniature. I wanted a guy actually lying prone sniping instead of just wandering around with a scoped No.4T. There are tons available for paras, but sod all for line infantry. I ended up using a 1st Corps para sniper that didn’t have the para helmet or a beret on (pretty much everybody wore the Denison smocks) and built him a spotter with a Tommy gun out of the Warlord plastic box. This sniper is a 1st Corps metal. Technically a para, but the ghillie suit cape thingy means he works for infantry. Spotter is Warlord plastic. I’ve gone for the generic “piles of junk” look for most of these, but one includes a Warlord miniature of a wounded man being carried to the rear. Again it’s a para miniature, but I’ve given him an infantry beret. The barrels are Renedra, most of the junk is resin tank stowage bits with a few plastic weapons from Warlord kits and some coiled barbed wire. The cam net is gauze dyed green and soaked with PVA. I’ve got a pretty good range of these. For firepower there’s a trio of Sherman tanks, for mobility there’s a pair of Universal Carriers (one of which packs a 50cal if required), for speedy recce there’s a Daimler Dingo, and I’ve got a jeep that only needs a little work to be usable. For the Poles in NW Europe I’ve got a Cromwell that just needs a bit of a tickle up and there’s an M3 half track kit on the shelf that I might build for them as an M5 too. Much of their fighting through France and the Low Countries after Falaise was in pursuit of retreating Germans, so their armoured recce regiment with the Cromwells and motor rifle battalion in the half tracks saw lots of action as they bumped into pockets of resistance. I’ve got a 6pdr with some extra plastics as crew. It’s a bit puny against late war German armour, but has better range and is more durable than a PIAT so it gets a slot on the roster. Warlord’s range of vehicles and guns is a lot better than their infantry IMO, and all but one of the Shermans is a Warlord kit. Nice work Andy on the New Zealand troops and yes I have to agree with you on the warlord plastic late war Brits, it took a couple of weeks to do what you said, work out and put all those pieces together, cutting off and rearranging arms, hands, legs even chopping bodies in half to get a more natural pose. I painstakingly put a Platoon together along with the support troops. The newer plastics released by warlord have better poses and are easier to assemble, I purchased a box of recently released German grenadiers and the figure have improved.